Autumn begins in the month of September, a season that promises cooler days and longer nights. But more significantly for sports fans, September marks the start of football season. Football remains America’s favorite spectator sport—and it’s also played by countless college and high school athletes, as well as those who enjoy an occasional pickup game in the back yard or on the beach. Yet, like many contact sports, football (even touch football) carries a risk of injury—and one of the areas of the body most vulnerable to injury is the mouth. Some of the most common dental injuries in contact sports include lacerations (cuts), tooth fractures, displacement (teeth pushed deeper into or out of their sockets), knocked-out teeth, and temporomandibular joint problems. While it’s hard to pin down the exact statistics, researchers estimate that over 5 million teeth are avulsed (completely knocked out) every year in the U.S. alone—a significant number of which are due to sports injuries. It is also estimated that the lifetime cost to treat an avulsed tooth ranges from $5,000 to $20,000! Given the prevalence of sports-related dental injuries, it’s no wonder that protective devices have been developed to minimize the risk. 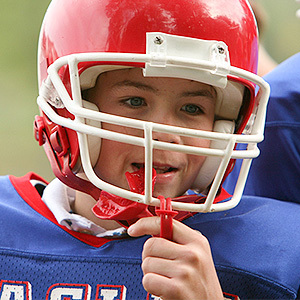 Properly fitted mouthguards have been shown time and again to be effective at preventing many types of dental injuries. Yet the use of devices isn’t always required by rule-making organizations—and many casual players don’t use them at all. That’s a shame, because so many of the injuries are preventable. It isn’t just football players who can benefit from mouthguards: Those with a passion for soccer, basketball, baseball, martial arts, and dozens of other sports can also get the protection they need from this small (but important) item. So this season, when you’re watching or playing your favorite game, think about the extra safety and peace of mind you could gain from a custom-made mouthguard.